A couple of weeks ago I found myself back in Canberra for two or three days, and I had a parcel to post. Yes, I could have posted it at home where you line up and they weigh your parcel, tell you how much it is, and give you your receipt, but I'd forgotten to go to the post office and it wouldn't wait till I got back. So I went round to the Woden post shop in Canberra. Last time, about twelve months ago, it had been a fairly conventional Australia Post outlet where you could post parcels, buy stationery, printer ink and SIM cards. However, I found it had moved round the corner and was a larger outlet. What was still the same was the queue of people wanting to lodge parcels and collect registered mail. And then I spied a self service terminal, the first I'd seen. So I used it. It was fairly conventional, basically a cross between a supermarket self service checkout and a library self service machine. Basically you weigh your parcel, type in the postcode it's going to, it works out the cost, asks you if you want tracking, and you wave your credit card at it. It also gives you the option of entering an email address to have a copy of the receipt mailed to you. The receipt never turned up in my mailbox, but we had the paper slip from the machine, and even though we keep them religiously we've never had to use them as we've never have had a problem with parcels going astray. Of course this time the parcel went astray (actually it hadn't, it had just take an an eccentric route through the Australia Post delivery network - Woden to Sydney via Hobart), and of course when we realised it might have gone AWOL we couldn't find the paper receipt - I suspect we'd accidentally thrown it in the bin along with some parking and restaurant receipts. So I went looking for the electronic copy. It wasn't in spam, or junk, or even automatically deleted because Thunderbird has taken a dislike to it, and as I've two email addresses, one which is harvested into the other I checked both services via their web clients. And because I buy a lot of books (and other stuff online) I checked my MyPost account in case it was there in my Australia Post Digital mailbox. Definitely, definitely not there. J, by this time had called Australia Post's helpline, found someone helpful (!) who had traced the transaction from the terminal logs and confirmed that it had got where it was going this morning, albeit with a short sojourn on the Apple Isle. Remember I said I had two email addresses (actually I've more, but that's another story) I use. In the midst of our panic I remembered that sometime ago when I was still working I'd used the other one to set up a second MyPost account to keep work stuff separate and simplify claiming expenses. So I logged into my other account for the first time in eighteen months, and yes there was the receipt, sitting in my digital mailbox. I'm guessing that the self service terminals have a rule that if the email address is associated with a MyPost account they save the docket to the account's digital mailbox rather than emailing it to you. I can't remember if it terminal asked me to scan my MyPost card or not - I didn't have it with me - before asking for an email address. 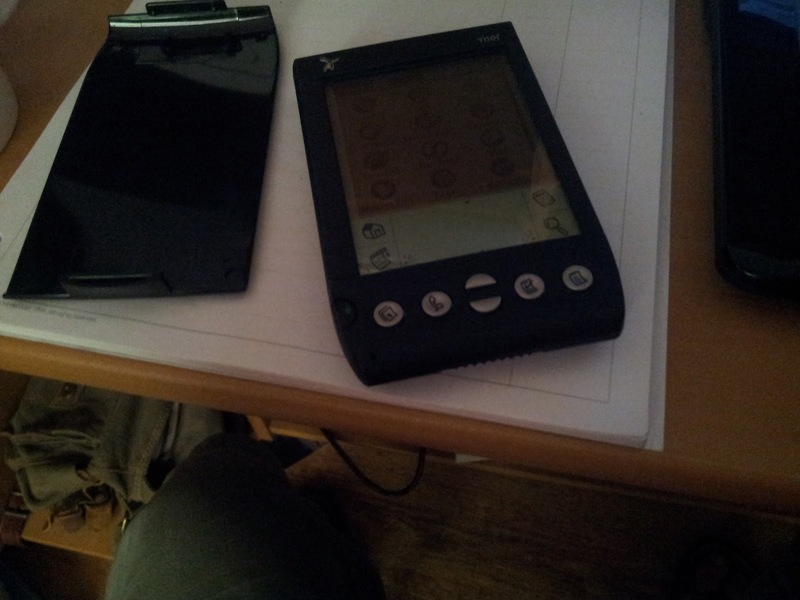 What I was looking for when I found my old Handspring Visor, was my old Samsung Galaxy Sii, which was my day to day phone until a couple of years ago when I upgraded to an S5. The reason I went looking for my old Sii was quite complex. If you're a regular reader of this blog you'll recall that we bought a pay as you go SIM from Telstra, the dominant mobile phone provider in our area, to complement our contract based regular phones as Virgin doesn't play quite so well (or at all in our case) in rural Victoria. Originally we had the Telstra SIM in an old Nokia phone because of the Nokia's superb battery life, but I switched it across to my old Samsung due to the spate of power outages we've been having recently - none very dramatic, an hour at most, but given the serious outages they've been having in South Australia, it's been a worry. Now our local powerline operator is a company called AusNet and they have a really helpful outages page on which you can check the cause and the estimated time to fix, but for this you need an internet connected device. Well, if our Virgin phones had been reliable we'd just have used them, or created an ad hoc temporary hotspot to get online, but as they're not reliable we needed to press my old Android phone into service, especially as Telstra have quite a fast bit of private network into the town. So what's it like winding back a couple of generations? Physically the main difference is the phone's smaller, with a smaller screen making onscreen typing more of the old fashioned hunt and peck (in fact remarkably like using my old Visor) than the smoother experience on a newer phone. The camera is not as sharp - no surprises there, but strangely, that's about it. Battery life's about the same, Applications, while they're older versions are more or less the same in use, and while one is Android 6.x and the other 4.x, there's very little difference in the user experience, suggesting we've more or less reached a plateau in UX as far as Android is concerned. Yesterday was ferociously hot, so hot that we put the cooling on before lunch. 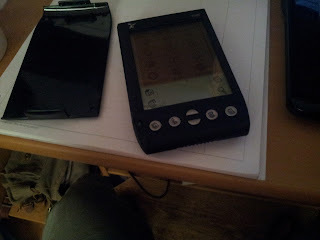 Too hot to do anything outside, so, given that I'd found not only my original handspring visor, but its sync cradle, I thought I'd install jpilot on my old EEEpc that now runs crunchbang and incidentally makes a very nice lightweight writing machine - more than a chromebook, less than a MacBook Air. Anyway, I read the instructions, installed pilot-link first (ok I didn't read all the instructions and had to back track on that one) then jpilot. It, of course, didn't work, and I set off on a wild goose chase involving usb ports and just about convinced myself that the sync cradle was dead. Well, I had a second cradle, so I tried that. Same result. Zilch. So this afternoon I thought I'd retrace my steps using my Xubuntu machine, given that it's a slightly more mainstream distro. Again zilch. And then I tried to run jpilot as root. And it worked - well almost, I had to make a palm user id first, and then it worked. As proof to myself I created a calendar entry with jpilot on my xubuntu machine, transferred it to the handspring visor, swapped the cradle over to the EEE, again ran jpilot as root, and downloaded the dummy entry into the jpilot datebook. There's several packages out there that can read Palm datebook and addressbook files and convert them to something useful, so I thought, naively, that there must be some code to take an ics format file and write it out in palm format, the idea then being to modify my orage import script and then overwrite the jpilot datebook file. 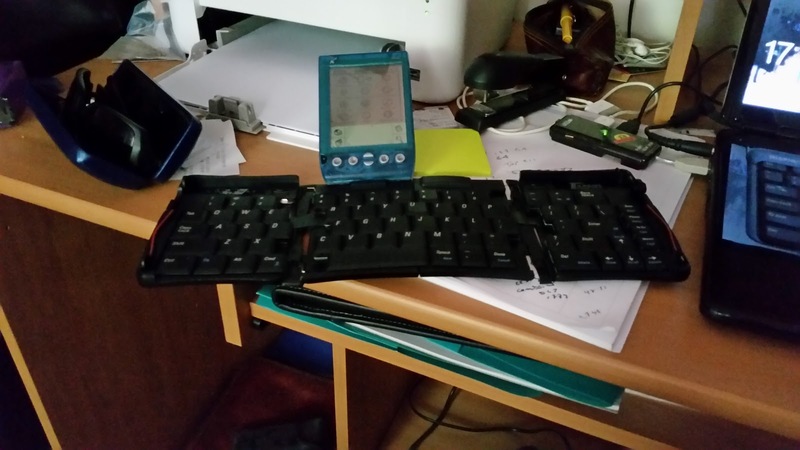 While looking for something else entirely, I found my old handspring visor neo (not my first, I had an older black one before it) and external keyboard. So I put a couple of new AAA batteries in it, restored the environment from the sdram backup module, and there it was, old emails, notes, and all. Keyboard still worked as well. Singularly useless nowadays when the phone does it all but nice to see old technology still working. Well a bit of digging suggests that the only real integration software option would be jpilot and installing it on my xubuntu netbook. Even then I wouldn't get offline email creation, something I used to think was a killer application, and given the lack of wifi on our local V/line service.